What Is Oregano and How Is It Used? Oregano is a familiar herb that many people know from dishes such as pizza and pasta sauce. One of the most widely-used herbs worldwide, it is found in Mediterranean and Mexican cuisine and is even one of the components of chili powder. The dried form is very common, but fresh oregano is also employed in some dishes. You can find it year-round in both forms. Oregano is an herb composed of the fresh or dried leaves of the oregano plant. The plant has tiny leaves that lend a pungent aroma and strong flavor to a variety of savory foods. When in bloom, the plant sports pink or purple flowers, which are also edible. As an herb, it is gluten-free and suitable for vegan and paleo diets. Common oregano is botanically known as Origanum vulgare, Greek for "joy of the mountains." It can be found growing wild on mountainsides of Greece and other Mediterranean countries where it is a herb of choice. It was relatively unused in America until returning World War II soldiers heightened the popularity of pizza. In fact, sales of oregano increased by 5,200 percent between 1948 and 1956 due to pizza mania. Mexican oregano (Lippia graveolens) is considered to be the strongest-flavored variety. It is actually from a different botanical family and is also known as Mexican marjoram or Mexican wild sage. If your recipe calls for Mexican oregano specifically, try not to substitute another variety. If you are making your own chili powder, use Mexican oregano for its strong, peppery flavor. Spanish (Origanum vivens) and Greek (Origanum heraclites) oregano have decreased depth of flavor. Oregano to one person may be something completely different to another, as it is easily confused with its close relative, marjoram. In the Mediterranean, oregano is also known as wild marjoram, but that doesn't mean it is marjoram. Marjoram's botanical name is Origanum majorana, so it is the same genus as oregano but it is a different species. Marjoram's gentler flavor is sweeter than oregano, which is slightly woodsy with a warm and aromatic taste. And marjoram's aroma is not quite as pungent as oregano's. Adding more confusion to the mix is—due to the close relationship between marjoram and oregano—that they look very much alike. Marjoram has leaves which are slightly hairy and more gray-green in color, while oregano has olive-green colored leaves, but overall they have similar appearances. Fresh oregano has the most flavor and aroma. Strip the leaves from the stem and discard the stem. 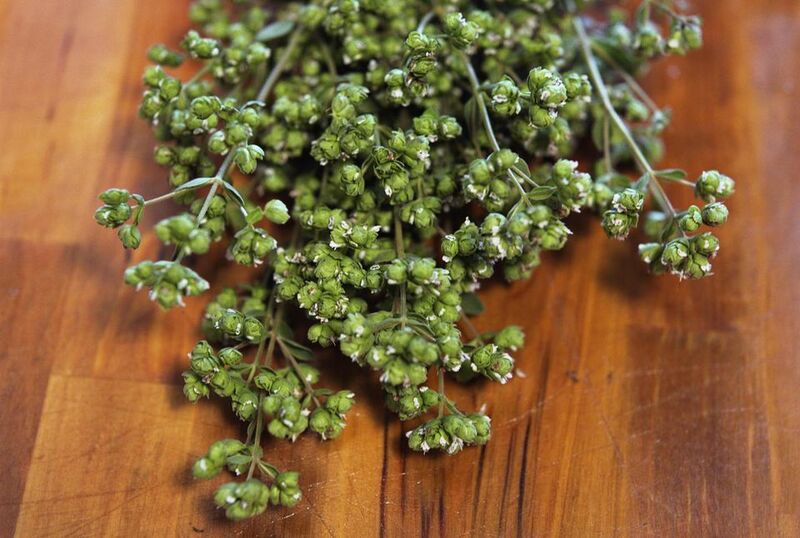 Fresh oregano is commonly used in a bouquet garni for making stocks and soups. For this use, do not strip leaves from the sprigs and instead tie it up with the rest of the herbs. It is easy to grow your own oregano as part of an herb garden so you have it easily available. Dried oregano is the more common form, and some people prefer it because it is more subtle and doesn't overpower dishes as fresh oregano might. The aroma of oregano has a camphor note. The taste is pungent and described as earthy and green with some mint and hay. It can be slightly bitter. Unlike some other herbs, dried oregano can be added early in the cooking process for sauces and stews as its flavors will stand up to cooking. Crush dried oregano to release more flavor before adding it to the recipe. If you have made your own dried oregano, use only the dried leaves and not the stems unless you are going to remove the stems from the finished dish (as in baking fish stuffed with sprigs of oregano and other herbs). Garlic, onion, thyme, basil, parsley, and olive oil are common complementary seasoning partners with oregano. Fresh oregano will have a more aggressive flavor, so it is essential that you are careful with how much you add. Too much can make the dish bitter and out of balance. Oregano can be used in more than just pizza and pasta sauce. The beautiful green herb adds a delicious, and perhaps unexpected, earthy flavor to several dishes including chicken, seafood, hamburgers, even beans. Also, try it in your next homemade pesto for a bit of a more robust topping for pasta or fish. If you find you are out of oregano, marjoram may be substituted. Use half of the amount called for of oregano. Basil, savory, and thyme are other possible substitutions. To substitute fresh oregano for dried, and vice versa, the equivalent is that 1 tablespoon fresh oregano equals 1 teaspoon dried. If your recipe calls for a measure of fresh oregano the conversion is that 1 ounce of fresh oregano equals 1/2 cup chopped fresh oregano. Dried oregano is readily available in small bottles in the spice section of the supermarket, and you can find it in bulk at warehouse stores. Fresh oregano is usually found in a plastic clamshell sold in the produce or fresh herb section, or you may find it at farmers markets. Look for bunches that are rich green and that haven't gone limp. Store dried oregano in a cool, dark, dry area in an airtight container (glass preferred). Fresh oregano should be stored in a plastic bag in the refrigerator. It should be used quickly, but if you include a slightly damp paper towel in the bag it might last for up to a week. Another way to store fresh oregano is placing the stems in a glass of water with a plastic bag loosely tented over the glass. You can also consider freezing fresh oregano to enjoy year round. Oregano oil has antimicrobial, antifungal, and antiviral properties and contains substances that have antioxidant and anti-inflammatory effects. Oregano essential oil is employed in organic chicken farming in place of commercial antibiotics. Oregano tea and oregano oil have been used as a natural remedy for indigestion, coughs, allergies, arthritis, and to stimulate menstruation. Medicinal amounts should be avoided during pregnancy due to possible risk of miscarriage. Be aware that oregano oil can interact with antidiabetic drugs and anticoagulants. It should not be taken before surgery as it increases the risk of bleeding. You Say Culantro, But Is It Cilantro?